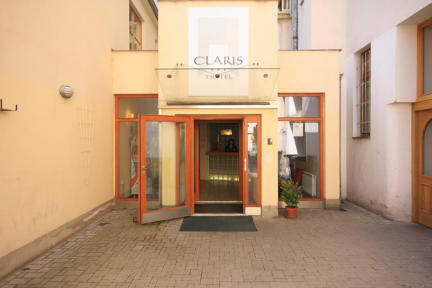 Hotel Claris, Praga, Czechy : Rezerwuj teraz! Property is close to Prague State Opera, Zizkov Television Tower, and Czech National Museum. Also nearby are Wenceslas Square and Municipal House Hall. Hotel offers accommodation in 24 rooms, all equipped with bathroom and satellite television. Bathrooms provide shower/tub combinations and hair dryers. All the rooms have WI-FI connection to the Internet. There is non-stop reception and parking in the yard. Breakfast is served daily from 8 till 10 a.m.
We also offer cozy and attic rooms in Residence Abacta (300m from hotel Claris). Nonstop reception and breakfast is in hotel Claris. Deposit for a key (in case of reservation in residence Abacta) is 40 Euro or 1000 CZK. These times also can be agreed individually.